Mesa Verde National Park Day 2 - Super Inky! My second day in Colorado started bright and early with the drive to the Mesa Verde park entrance. Once we pulled into the park, we had about an hour's drive ahead of us to get to Cliff Palace for our tour. It's a beautiful drive and you can look out over the landscape for miles. When we made it to the parking lot, we walked down a short path to meet Ranger Wolf for the tour! To get from the overlook where the tour group met down to Cliff Palace, we all had to take some narrow stairs. I was a little nervous, but I remembered that my mama did it when she was only six! Soon, we made it to a little shelf right by the cliff dwellings. 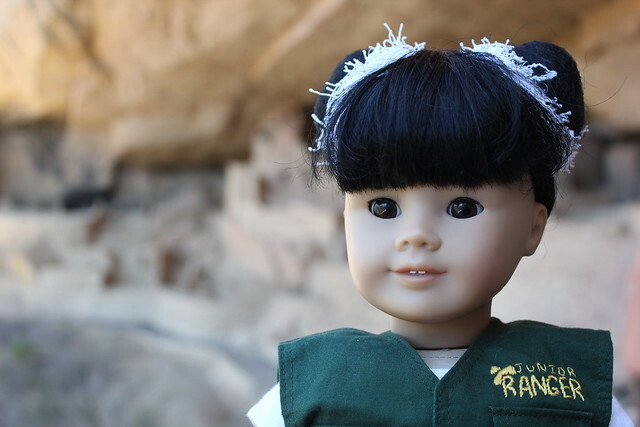 Ranger Wolf taught the group about the people who had lived in Cliff Palace. He also shared some stories about a group of Hopi kids, the descendants of the Ancestral Puebloans who built Cliff Palace, who had visited recently. Then, it was time to walk through Cliff Palace! Cliff Palace is really beautiful! Ranger Wolf taught us that the Ancestral Puebloans who lived there would farm and raise turkeys on the mesa top. The girls would carry water from springs in large potteries. Wow! I imagined carrying a load of water; it probably wasn't fun. I'm glad I get my water from the faucet! Can you see that some of the doors have a T shape? That reminded me of the doors at Chaco Canyon! Also, do you see the tall tower toward the right of the picture? The upper stories are actually reconstructions. Cool fact, right? The group gathered around a kiva, a ceremonial space, to listen to Ranger Wolf talk and answer questions. He's a great ranger! 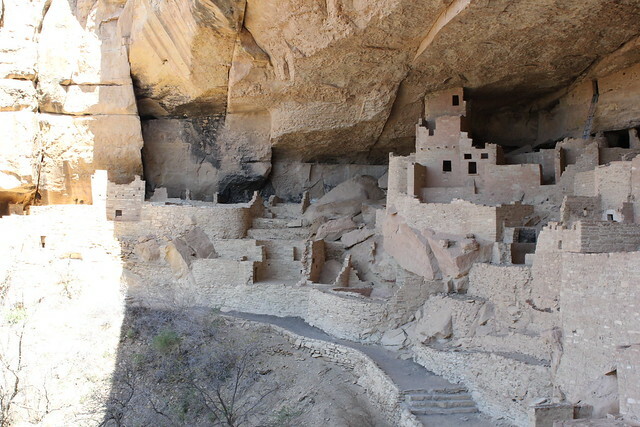 Places like Mesa Verde's Cliff Palace make me understand how badly I want to be a park ranger someday. Sometimes I worry that I made the wrong decision when I decided to stop dancing so seriously, but when I am at one of our nation's national parks, I know I made the right choice. 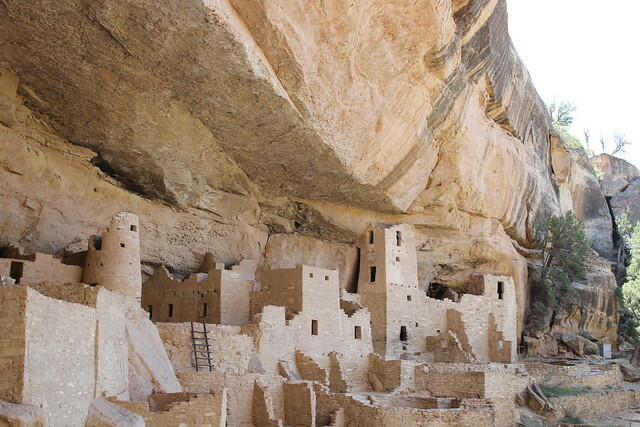 As the ranger talked, I daydreamed about working at Mesa Verde someday. That would be so cool! Before we made the climb back up to the top of the mesa, I looked back behind me. See that lookout point where all the people are? That's where the tour group started! We had to climb down into Cliff Palace from there. Can you imagine living at Cliff Palace and climbing up and down from the mesa top multiple times a day, all while carrying water? Wow! Cliff Palace was definitely a tough place to live, but it was beautiful. I wanted to ask the ranger if the people at Cliff Palace were among those who would walk to Chaco Canyon, but I didn't get a chance. It would have been a very, very long walk. It took my family several hours to drive from the Chaco access road up to Mesa Verde. Still, I think it would have been a gorgeous trip. The Four Corners region is so beautiful! I took a last look back at Cliff Palace before it was time to climb up to the mesa top. That's right- I said climb! 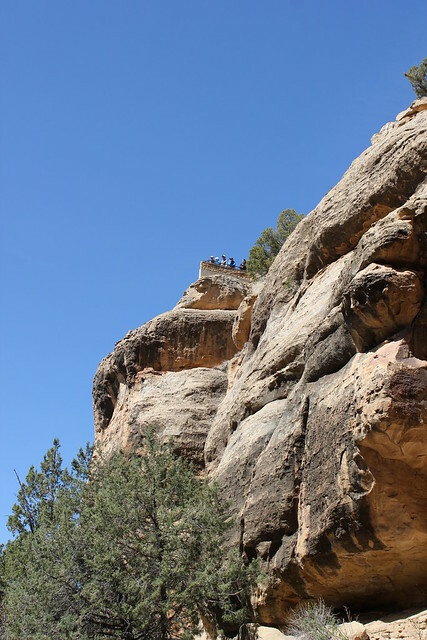 To leave Cliff Palace, visitors have to climb a series of ladders. Awesome! As you climb out, you can see the hand and toe holds that the Ancestral Puebloan people carved into the walls. I kept thinking of the girls climbing with the pottery jars of water. I was really impressed by that information. 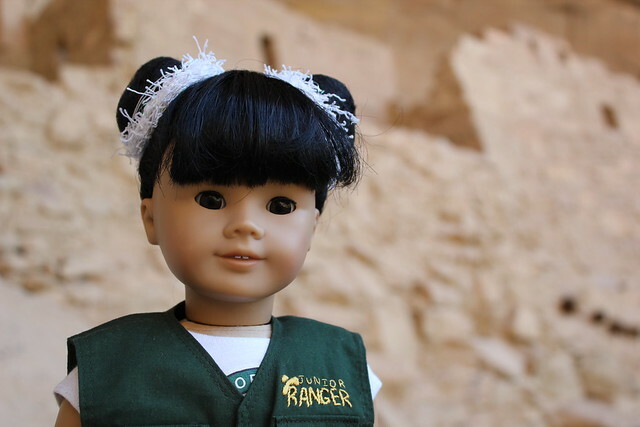 I loved visiting Cliff Palace, but soon it was time to make the drive down to the visitor center to turn in my junior ranger booklet and receive my new badge. The ranger who read over my booklet was really nice. 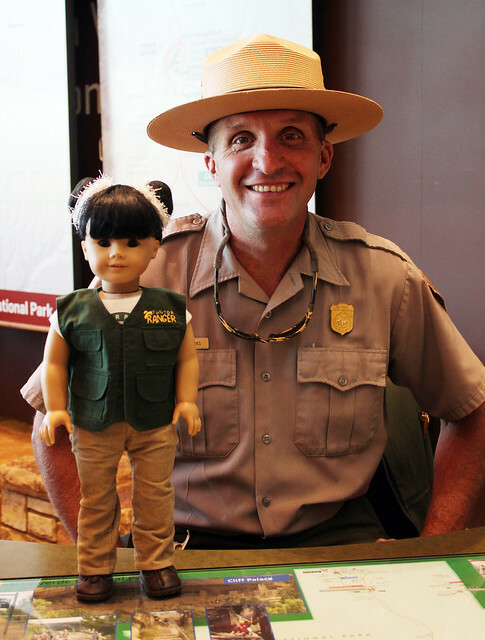 He was happy to give me my newest junior ranger badge! I told him that my mama and grandma are from two of the Rio Grande Pueblos and he impressed me by saying hello in one of the indigenous languages. 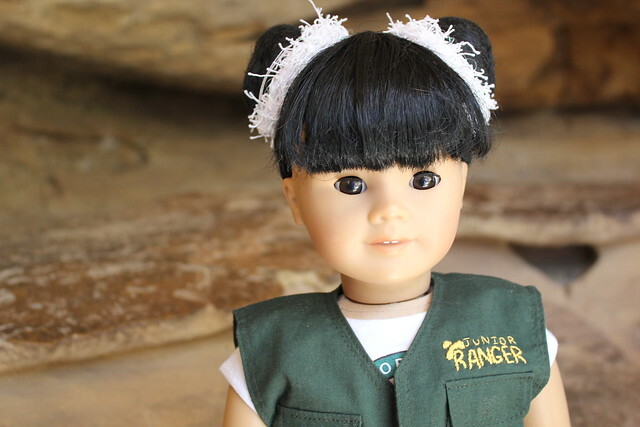 Someday, it's going to be me swearing in junior rangers! 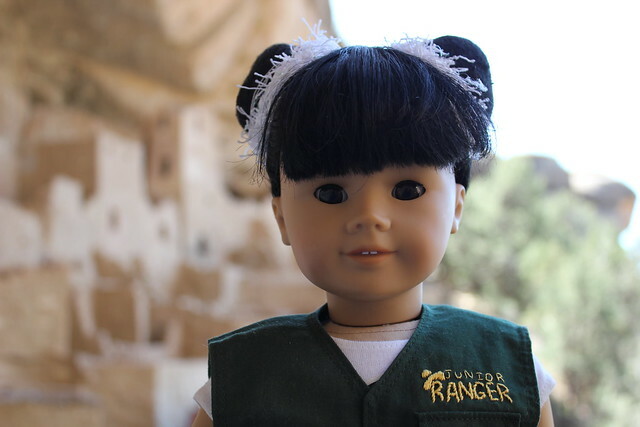 Until then, I'm me, Junior Ranger Inky! What do you think? 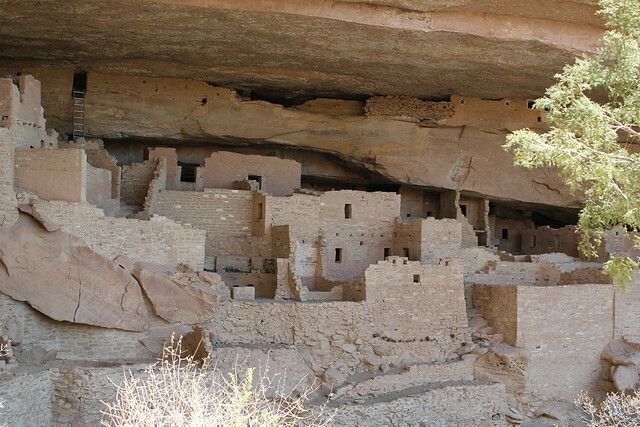 Would you like to visit Mesa Verde National Park someday? Awesome Inky! The Cliff Palace is beautiful. I would have been scared on the stairs and ladders. Hope you get to be a ranger someday! Oh, Inky! You were here in Colorado! I have never been to Mesa Verde, but Mama has been there many times. I think I'd like to be a ranger, too. When I was in Big Bend there was a ranger who know all of the birds by there songs. I thought that was really cool!